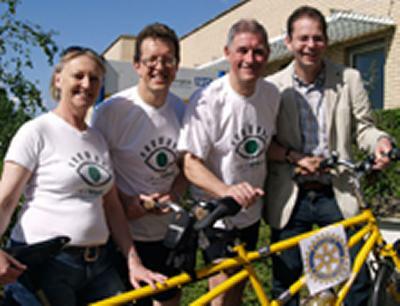 Two Romsey Rotarians will soon be cycling 820 miles along the River Rhine on a tandem to raise money for the Gift of Sight charity, founded by the University of Southampton. Bill Gidley, husband of Romsey MP Sandra Gidley, and fellow Rotarian Graham Lee will don their cycling gear on Sunday (15 June) to begin their sponsored journey down the River Rhine. The trip will see them pass through Switzerland, Germany, France and The Netherlands. Bill and Graham, both members of the Rotary Club of Romsey Test, are strong supporters of Gift of Sight as Bill has battled with macular degeneration since his late teens. Up until a few years ago, he had still managed to ride a push bike with reasonable confidence. Eventually the slow and gradual deterioration of his sight got to a point where cycling on unknown roads was no longer very safe. In 2006 Bill and Graham rode their tandem from Land’s End to John O’Groats, raising over £7,000 for charity, and this led to them discussing other ‘big rides’. They finally decided on cycling along the route of the Rhine which, starting in Switzerland and ending at the North Sea, is a very similar distance to the previous ride. Follow Bill and Graham’s progress by logging on to www.cyclerotary.com. During the ride, the website will have a daily blog and the pair’s progress will be displayed on a map, thanks to support by SPOT GPS. The Gift of Sight Appeal was founded by Professor Andrew Lotery at the University of Southampton in July 2004 with the aim of funding world-class research into the prevention and treatment of blindness. The main areas of research are age-related macular degeneration, the commonest cause of blindness in the western world, glaucoma and nystagmus. An adult stem cell programme should lead to better treatments for a variety of eye conditions, including cone dystrophies, retinitis pigmentosa, diabetic retinopathy and age related macular degeneration. Gift of Sight is an appeal managed by the University of Southampton Development Trust Reg. Charity No.295753. The ride will commence on Sunday 15 June and the ‘team’ will start the journey from the source of the Rhine in Andermatt, Switzerland, and end just beyond Rotterdam, at the Hook of Holland, where the river meets the North Sea. This is a distance of some 820 miles.